Located in Southern Africa, Namibia is the second least densely populated country in the world (behind Mongolia). It is a country of vast wilderness and giant sand dunes. The Namib Desert, the world’s oldest, and the Kalahari Desert make up over 80% of the country’s land mass. So why would someone want to go to a country that is mostly a desert? 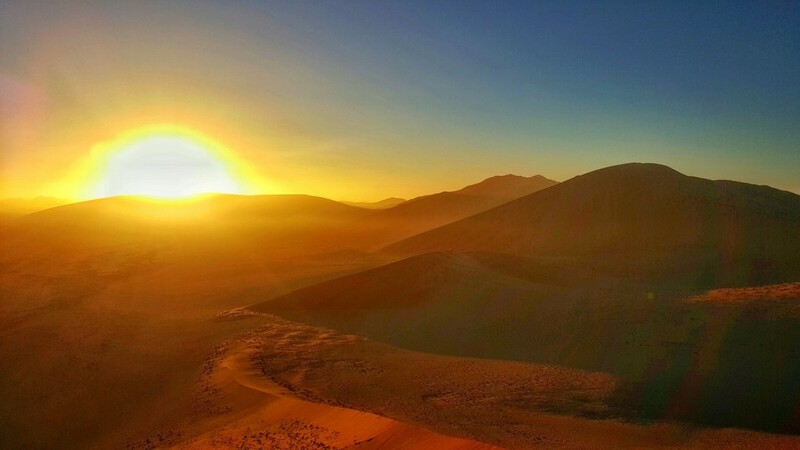 If you haven’t seen pictures of Namibia, well then you are in for a treat. Namibia is hands down my favorite country in the world for photography. The landscapes are freakin’ stunning. While the environment is harsh, it is one of the best countries in Africa for self-driving. Road infrastructure, while mostly gravel, is very good. 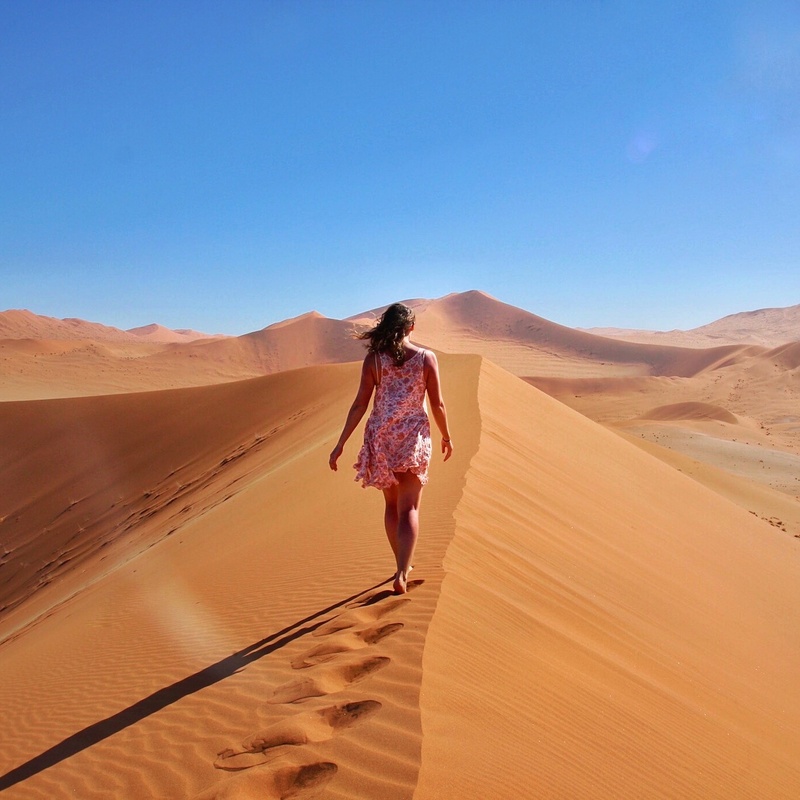 Namibia is a perfect destination for a two-week safari and even awesome for backpackers. Namibia was our first stop in Africa. Yana had been to the continent once before and had undertaken an overland trip from Kenya to South Africa. Namibia excited us with two places on our mind: Etosha and Sossusvlei. During our trip, we had two major mishaps that were quite important in shaping some future decisions. One was hiking in the Naukluft Mountains for 17 kilometers. Never have we been more scarred or beaten up from a hike in our entire life. Wrestling with rocks and boulders for nearly 10 km, both of us left this hike with twisted ankles, bent bodies, and a bruised morale. The lesson? We are still not sure, but for starters, get proper hiking boots. Another mishap was during our adventure on the coast north of Swakopmund. Because we were on a budget (interchangeable with cheap), we rented a tiny Volkswagen Polo. This car was not much bigger than a MINI. It worked great, and aside from one flat tire, there were no issues. We drove the 108 miles up the coastal highway from Swakopmund. 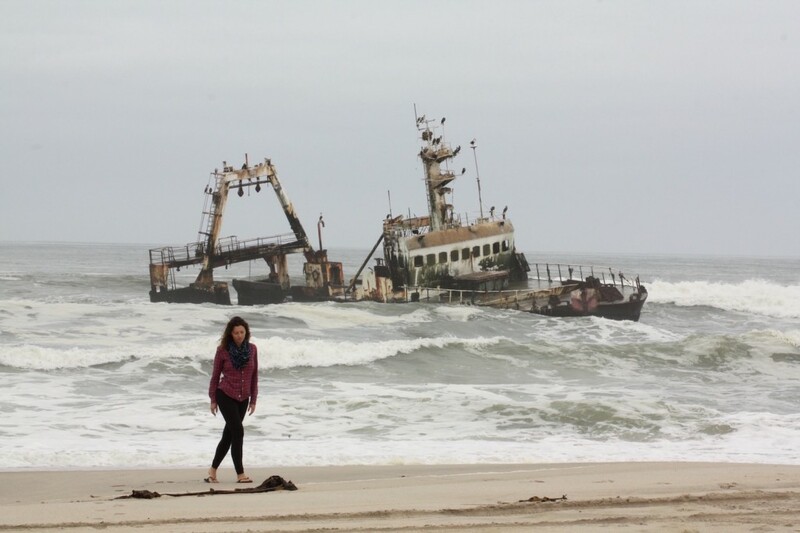 Beyond Mile 108 is the entry to the Skeleton Coast, one of the most remote places on earth. You need a 4WD to enter, so this was our turning point. Along the way there were some nice overlooks and two very cool shipwrecks. We would pass beach after beach, but the highway was often quite far from the coastline. I decided it was a good idea to take one of the beach exits. It was clearly marked 4WD on their exit sign. I saw this as a challenge. The first five minutes was fine. We were cruising on compact sand that was not much different from the gravel road we just departed. To be on the safe side, I was driving a little fast, maybe 40 kph, to get through any patches of sand. My thinking was we could drive to the edge of the beach and walk from there. Just as the beach came into view, and maybe that is what distracted me, the road was overtaken by sand. Too little too late, my reaction was to hit the gas. I thought we could plow through it. I was wrong. We came to an immediate halt. Yana was recovering from a cold, so I checked on her vitals, made sure I didn’t just break her neck, and went outside to investigate. Our car bottomed out. And when I mean bottomed out, we were about 10 inches deep in the sand. The entire car. I had nothing in the car to dig us out. Laying on my stomach, I used my flip-flop as a shovel. After 10 minutes of effort, Yana was passed out with her flip-flop in hand. Roughly three hours later in 100-degree heat and a sick wife, we got the car out. There was a lesson to be learned here. Was it, trust road signs when it says 4WD? Maybe drive a little slower so we can stop before a patch of sand? What about, don’t be so cheap and rent a 4WD in the desert? These all would be some good lessons to learn, but the funny thing is, I didn’t learn any of them. The same thing happened 6 weeks later in Botswana, this time surrounded by elephants and lions. Read that story here. The best time to visit Namibia is between April and October. The earlier months of April and May have the best weather during the year, although it still gets very hot. The dry season is between June and October. This is the best time to view wildlife in Namibia. Visitors from Western Europe, USA, Canada, Japan, the UK, and South Africa do not need a visa. For other countries not listed, please refer to the Namibian High Commission for more details. Passports must be valid for at least 6 months from the date of entry into Namibia. It is required to have at least 1 completely blank page. MTC is the best for cell coverage. Purchase a sim card in Windhoek and not at the airport, which is three times the price. Make sure to ask about their specials. We purchased 100 minutes airtime, 700 SMS, and 1 GB data for 30 NAD ($2.50 USD). It was a one-week plan that was very easy to renew each week. The infrastructure in Namibia is very good. It is very safe to drive on your own. However, many roads are gravel or dirt, so there are risks of flat tires. We recommend getting the extra tire and windshield coverage on all rental vehicles, which typically is not included in the base rental agreement. Most of the country is accessible with a small car. The exception is driving off-road, the Kalahari Desert, the Skeleton Coast, and the last few kilometers at Sossusvlei. We hired a small Volkswagen Polo which cost us around $20 USD per day. 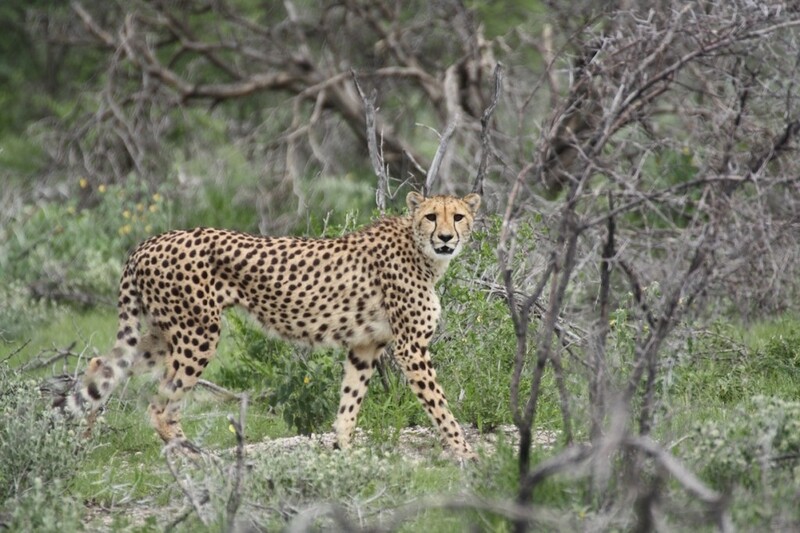 We could drive to nearly every famous place in Namibia, including a self-drive safari in Etosha National Park. While 4WD is not required in Namibia, it is a great way to travel through this barren country. If you plan to drive off-road or to the Skeleton Coast, you will need a 4WD to do this. 4WD rentals often come equipped with a rooftop tent and camping equipment. Rentals cost around $60 USD per day. For places to stay in Namibia, we recommend booking through Agoda. They have a wide choice of accommodation with different priced options. For camping, many hotels and guesthouses do not list these online for booking, so we found campsites via blogs online or word of mouth. We recommend a campsite for each place in our itinerary. Camping is the most common type of accommodation is Namibia. Every national park has campsites which is an excellent way to save money. 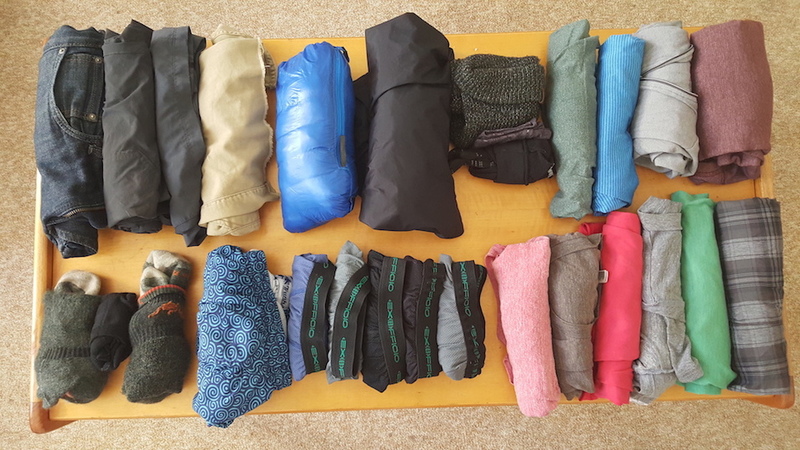 Private campsites typically cost between 100 NAD and 160 NAD ($8 – $13 USD). National Park campsites range between 180 NAD up to 500 NAD ($15 – $40 USD). 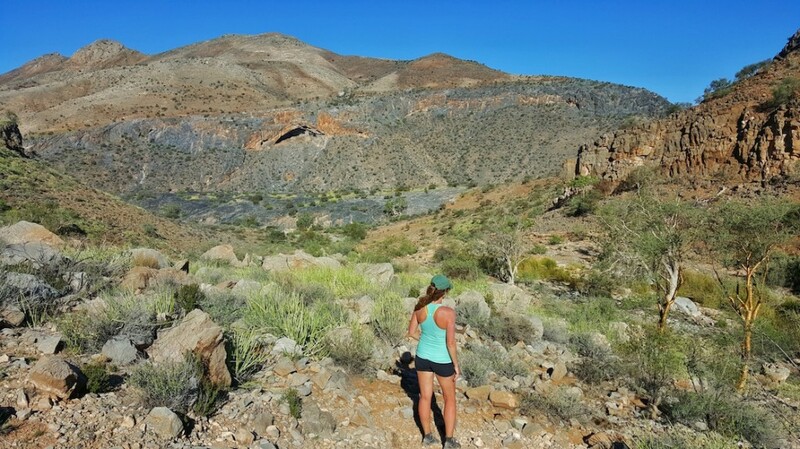 Backpacking in Namibia is quite common; however, backpackers and hostels only exist in Windhoek. Backpackers typically camp in Namibia when not staying in the capital city. Dorm beds cost around $150 NAD ($12 USD). While staying in Windhoek, we recommend the Cardboard Box hostel. There are hotels and guesthouses located near all major tourist sites. Typically, they are found just outside the national park entrance. Basic rooms cost between $40 – $60 USD. 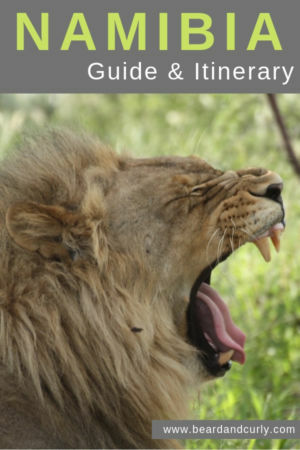 Game lodges at Etosha cost between $100 – $180 USD. Namibia is a massive country with very little population. There are stretches of driving for several hours only to pass by a couple of towns that resemble a few abandoned buildings and a mechanic shop. Supermarkets are hard to come by, so when you see one, stop. It is good to stock up on dry goods and canned products for several days at a time when on safari or in the desert. Cooking your own meals in built-in BBQ areas called a braai are common, in fact, we did this every night in Namibia. Every campsite has a braai pit, and firewood is always readily available. It is good to come prepared each night with firewood and a pair of tongs. The type of food in Namibia is basic. There is a large German influence, so it is very meat focused. Because of the terrain and difficulty to grow vegetables, it is very hard to find good produce, or any at all. Namibia is a difficult country to travel for vegetarians and vegans. Yana is vegetarian and her daily meal usually was a salad we named the African Salad. It consisted of avocado, fresh tomatoes, and canned chickpeas or beans. Grab some salt and curry powder, and it’s actually very good. This was the basis of her diet for several long months, and Namibia started it off strong! Arrive into Windhoek and finish any last-minute planning. Pick up a rental vehicle, map out your itinerary, grab some supplies, and get on your way! Make sure to double-check the registration is current and a full-sized spare tire come with the rental. Drive to Etosha National Park in the morning, stopping in Otjiwarongo or Outjo for camping necessities. 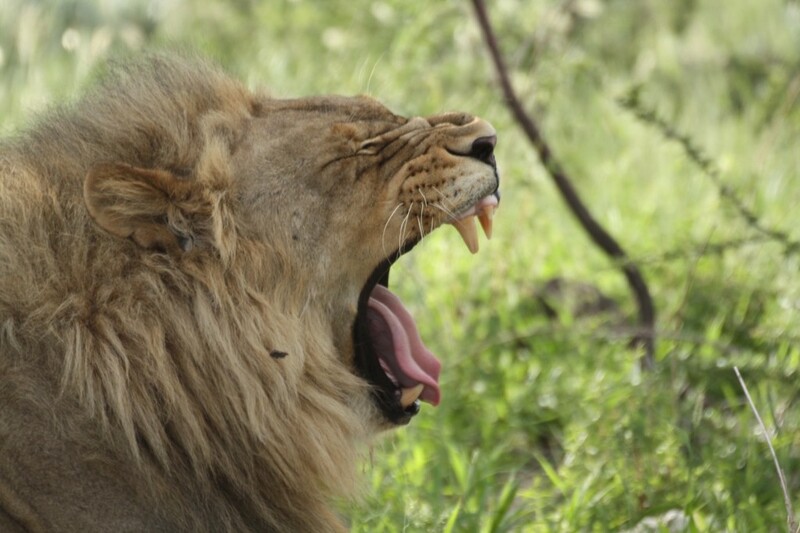 Make sure to get enough food and firewood for your entire stay in Etosha. There are a couple of stores you can get food and firewood in the park (at the campgrounds), but they are very overpriced and the food is not good. Stay outside of the Anderson gate the first night and then spend two days on safari while staying in the park. Third night at Namutoni Resort Campground 250 NAD per campsite plus 120 NAD pp camping. For a detailed article on our Safari including the best stops to make and where to see the best wildlife, check out our full blog post on Etosha National Park. On the morning of day 6 drive to Opuwo. If you are visiting in March/April, call the Ruacana Lodge and ask if the waterfall is flowing. If it is, this 45-minute detour is a must. Located on the border of Namibia and Angola, the Ruacana Falls only flows 6-8 weeks per year. It normally is dammed and a major power source of energy for the entire region. When it flows, it is a massive waterfall that is stunning and is comparable to Victoria Falls. From here, you are not too far from Opuwo. 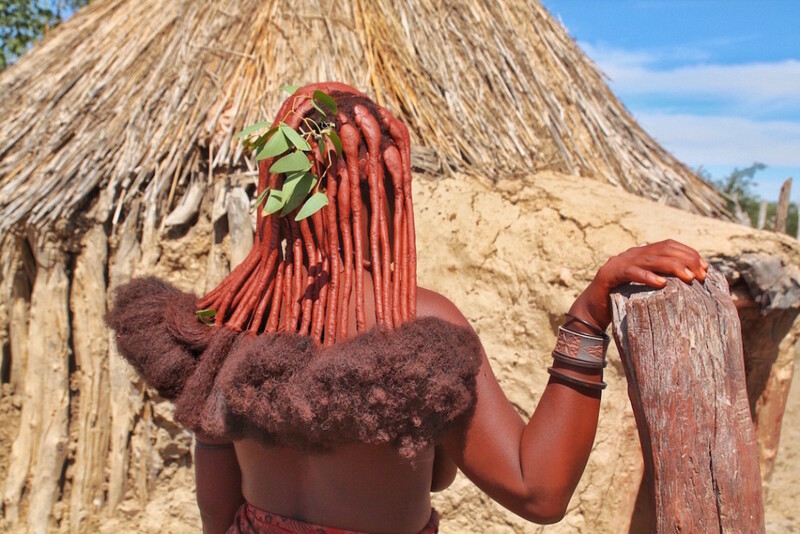 Go on a tour of a traditional Himba village. This is one of the most different cultural experiences you can get anywhere in Africa and a highlight for us in Namibia. To plan and have an amazing Himba tour scheduled when you arrive, read our full blog post on our Himba Village Tour. On the morning of day 7, drive to Swakopmund. This is a long driving day through the desert. Swakopmund is known as the adventure capital of Namibia. The stunning sand dunes of Dorob National Park surround this coastal city. Get out and explore the sand dunes the following day. There are several options for tours including skydiving, sand dune boarding, or a 4×4 quad tour. 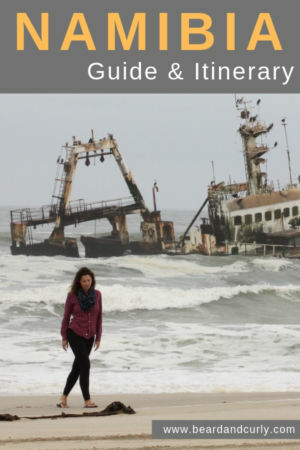 For more information on tours we recommend and the best places to check out near Swakopmund, read our full blog post on Swakopmund and the Outdoor Activities. We are avid hikers, and through word of mouth, we were recommended to hike in the Naukluft Mountains. There are two trails to explore, either the Olive Trail (10km) or the longer Waterkloof Trail (17km). We opted for the Waterkloof. Sure, the scenery was beautiful at parts, and hiking in the desert is fun. However, most of this hike is through dried up riverbed, which means walking 10km over small and medium-sized rocks that move beneath your feet at each step. We finished this hike with four twisted ankles and Yana literally cried when we saw the finish. This hike has scarred us for life, and we don’t want it to happen to you. The Naukluft Mountains are a wonderful place to camp. It is best to enjoy the beautiful scenery on the short trails to several watering holes. If you are looking to do a longer hike, opt for the Olive Trail instead. Stay: Capricorn Rest Camp 80 NAD pp for camping, but seriously, spend the extra day at Etosha, Swakopmund or near Sossusvlei. See the full article on our Waterkloof Trail hike. Drive to Sesriem in the afternoon and stay at the NWR Campground in the National Park. Wake up early and head to the park gates at the exact time they open (usually 1 hour before sunrise). First stop at Dune 45. The drive is about 30-45 minutes. Hike up to Dune 45 to watch a memorable sunrise. Continue driving to Sossuvlei. Get here as early as possible, the heat is excruciating by mid-day. 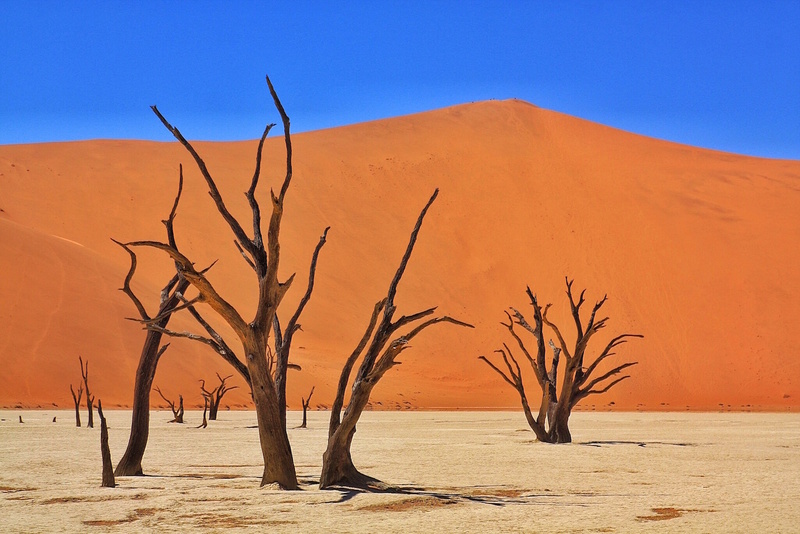 We recommend around 2 hours minimum for walking around Sossusvlei and Deadvlei. There are shuttles for the last 5km to Sossuvlei, but we hitched a ride no problem. 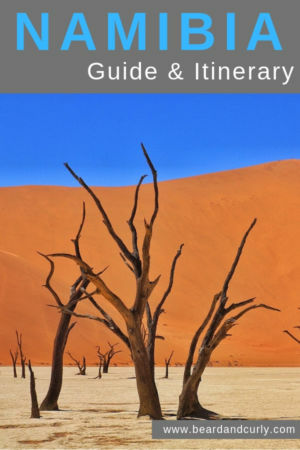 For more information on Sossusvlei and Deadvlei read our full blog post on Sossusvlei and Deadvlei. Today is another long driving day. Head from Sesriem down to the coastal city of Luderitz. This German colonial town did not have much to excite us, besides one of our favorite restaurants. What IS exciting, is a ghost town that you passed by on the way into town. 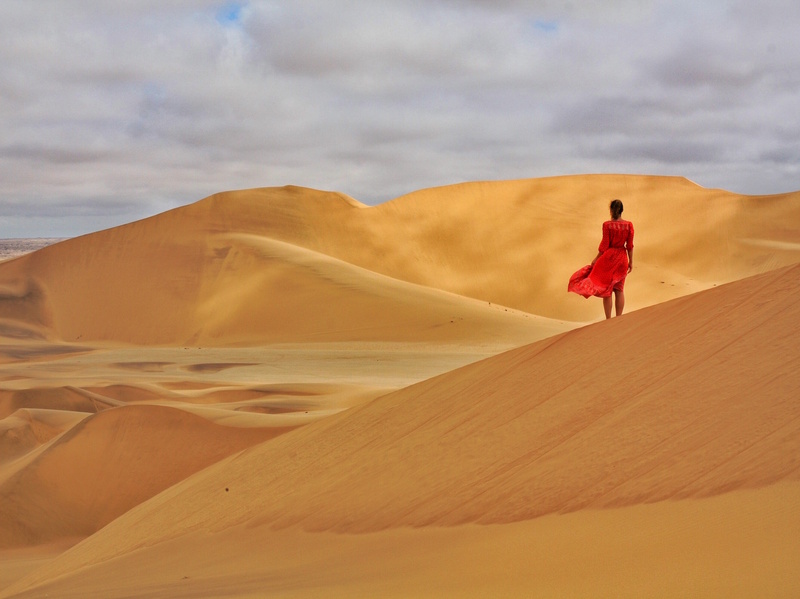 Just outside Luderitz are stunning sand dunes to explore as well as the Kolmanskop ghost town. 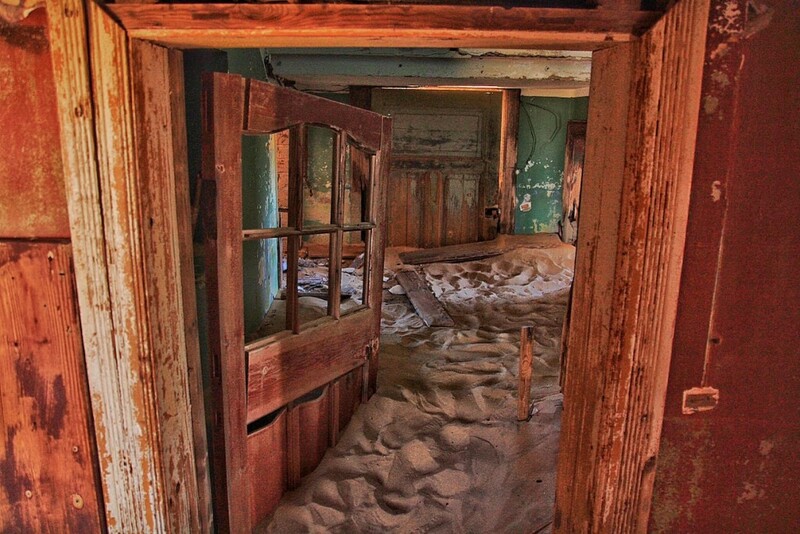 This eerie abandoned town was a gold mining town that has been taken over by the Namib Desert. Exploring this town is a must. To check out more on our favorite restaurant in Namibia and our tour of Kolmanskop, read our full blog post on Luderitz and Kolmanskop Ghost Town. Drive down near the border of South Africa to Africa’s largest canyon. The Fish River Canyon has two main entry points, Hobas and Ais-Ais. There are several overlooks to capture stunning views of the canyon. Ais-Ais is also known for its hot springs. Stay: Ais-Ais Hot Springs Resort 169 NAD pp inside the national park. If heading to South Africa, drive the 1 hour to the Orange River and stay at Felix Unite 150 NAD pp Camping. 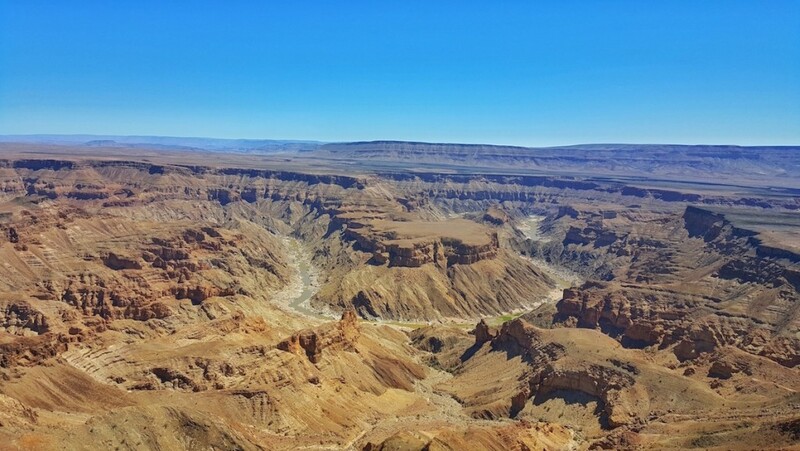 For more information on the best overlooks read our full blog post on Fish River Canyon. Today is the last day of your amazing Namibia tour. Wasn’t it incredible!? Head back to Windhoek to finish your trip. Another option is to overland into South Africa and head down to Cape Town. Plan for one hour at the border control into South Africa. Camera with zoom (telephoto) lens – we recommend between 200 – 400 mm. Check out the Canon 70-200mm lens for the best quality you can get! Namibia is full of natural beauty. From seeing the Big 5 in Etosha, the amazing sand dunes of Sossusvlei, and the largest canyon in Africa, Namibia cannot be missed. Namibia is one of my favorite places in the world and is one of the most beautiful countries for landscape photography. 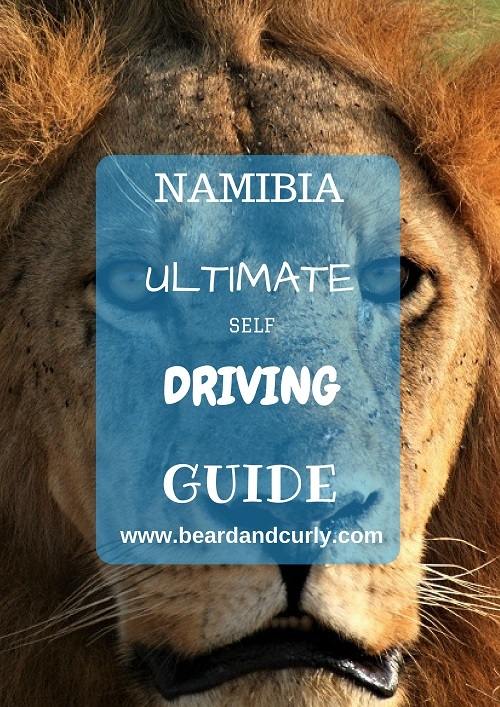 Check out each of the articles on Namibia to see more details to plan an epic trip!